Economic crises and fiscal accounts are closely interrelated, although the nature of that relationship is controversial. 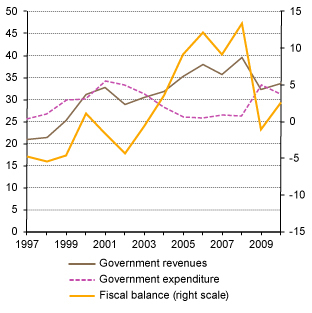 It is clear that fiscal balances Fiscal balance is the balance of a government's tax revenues, plus any proceeds from asset sales, minus government spending. 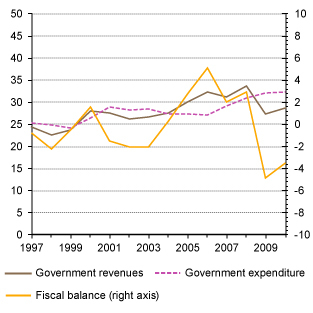 If the balance is positive the government has a fiscal surplus, if negative a fiscal deficit. deteriorated significantly in all regions with the crisis, but this correlation does not reveal causality. As several governments and international institutions are adopting fiscal austerity policies aimed at reducing their public-debt-to-GDP gross domestic productratios, it is important to examine whether such a policy tackles the roots of the problem. Note: East, South and South-East Asia includes: China, China, Hong Kong SAR, Taiwan Province of China, India, Indonesia, the Islamic Republic of Iran, the Republic of Korea, Malaysia, Nepal, the Philippines, Singapore, Sri Lanka, Thailand and Viet Nam. 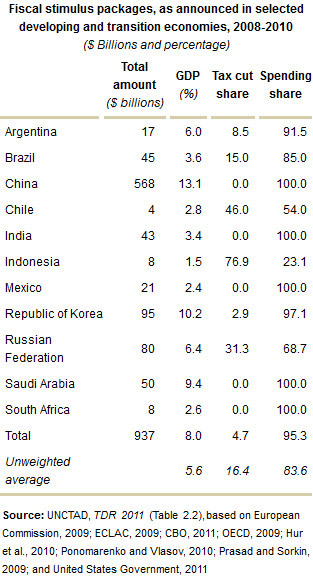 (Percentage of current GDP) Source:UNCTAD, TDR 2011 (Chart 2.2), based on the European Commission, AMECO database; OECD, Economic Outlook database Note: Transition economies exclude Croatia and Montenegro, but include Mongolia. economies alike. 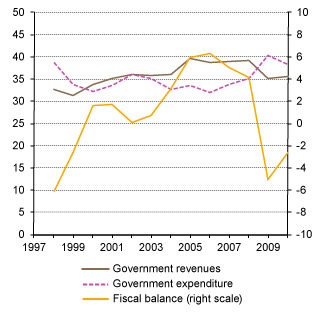 However, economic recovery in developing countries and transition economies led to a significant improvement in fiscal accounts, while governments’ deficits remained high in developed countries. These trends are mirrored by the evolution of the public-debt-to-GDP ratios: Public debt Public debt are the external obligations of the government and public sector agencies. ratios generally declined before the crisis, and it is only after 2008 that they increased considerably in high-income countries. The fiscal responses to the crisis varied considerably across regions and countries, not only in terms of the size of their economic stimulus, but also in terms of its composition and timing. A detailed assessment of fiscal stimulus packages is not straightforward, because it is difficult to distinguish policy measures that were adopted in response to the crisis from others that were already planned or that would have been implemented in any case (e.g. public investments for reconstruction following natural disasters). Note: a The amount reported for the United States refers only to the stimulus package provided under the American Recovery and Reinvestment Act (ARRA) of 2009; it excludes the cost of industry bailouts and capital infusions that were components of the Troubled Asset Relief Program (TARP). In addition, official announcements are not always made at the expected time, and they only provide a general idea of the size and composition of the packages. Among developed countries, the United States implemented the largest stimulus package, in both nominal terms and as a percentage of GDP. A relatively large share of the announced fiscal stimulus took the form of tax cuts (about 40 per cent) in developed countries, compared with only 5 per cent in the larger developing and transition economies (Table) . Governments of many natural-resource-rich countries, where public finances had a strongly pro-cyclical bias in the past, were generally able to adopt proactive countercyclical policies, despite the fall in commodity prices. During the commodity boom of the 2000s, several of these countries adopted fairly prudent fiscal policies, resulting in larger reserves. 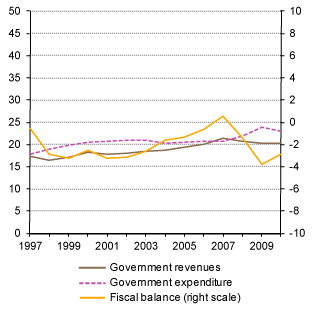 When the crisis erupted, they could increase their spending to moderate its impacts. 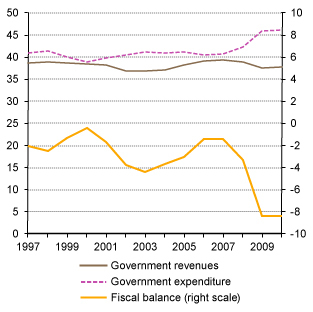 In many respects, the fiscal problems have been the result, not the cause, of the financial crisis. For that reason it would be more sensible to reduce debt-to-GDP ratios by boosting growth rather than cutting spending and increasing taxes to reduce debt, which might backfire and reduce growth. Excessive reliance on fiscal austerity might end up promoting an environment of low spending, reducing the chances of a private spending recovery, in particular in developed countries. Ultimately, it would not result in fiscal consolidation. 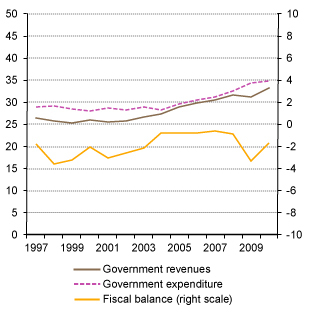 The latter can only be achieved in highly indebted countries through a recovery of growth in the medium term, to which fiscal policy can contribute; in cases in which it would be difficult to increase total expenditure or reduce taxation, fiscal stimulus can be provided by changing the composition of spending and revenues. In particular, progressive income redistribution and public investment in infrastructure and alternative energy might be a suitable and simple way to boost demand, while creating the conditions for further growth. Recovering growth is essential for curbing high public debt-to-GDP ratios; fiscal austerity may well be a self-defeating strategy.